What I really wanted was to swim in the Roman Baths, but you are not allowed to, so we went to Thermae Bath Spa, as a birthday treat: the water is from the same hot spring. I did have a lovely massage, but the rest was quite strange, like being on a Dr Who set: all these people wandering round in identical dressing gowns, all looking really passive and relaxed. I do not do relaxing so I was the only one paying attention. And the rooftop pool… very strange. Snogging and noodles (the blue foam things are noodles I am told), at an almost un-swimmable 35 degrees. As for the Steam Rooms, well, that is where the alien invasion will begin, you mark my words. They’re all pod people! An interesting experience but they probably have my DNA on file now as a subversive…. On the other hand, I was gawped at today merely because I got into Ullswater. Can’t see why: it was hardly less than 8 degrees. 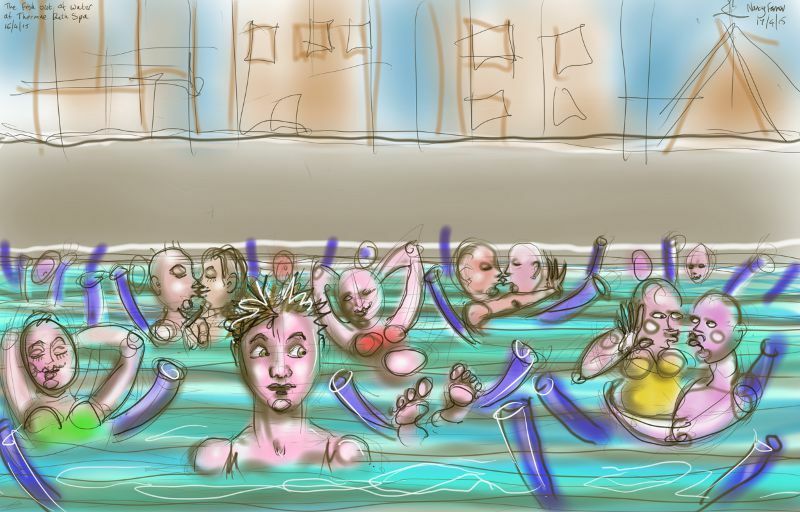 This entry was posted in Places, swimming and tagged art, Bath, digital sketch, drawing, humor, illustration, somerset, swimming, Thermae Bath Spa on April 17, 2015 by Nancy Farmer.